Avocado makes a delicious dressing for this quick and easy, simple summer vegetable salad. 1. Preheat the oven to 200°C, gas mark 6. Take a sheet of filo and arrange on a large chopping board. Brush with garlic oil then lay another sheet on top, brush again with the garlic oil, add another pastry sheet and brush with oil then scatter with half the spice mix. Cut the sheets into 10 strips and place on a flat baking sheet. Repeat with the remaining 3 sheets of filo, on a second large baking sheet. Bake for 10 minutes until golden and crispy. Set aside to cool. 2. Meanwhile, blend the avocado with the lime juice, soured cream and avocado oil together in a liquidiser or a jug with a stick blender, until smooth. Season generously. 3. 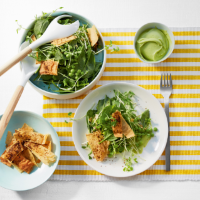 Toss the fresh peas, pea shoots and spinach in a large bowl, scatter with crispy filo and toss to combine. Serve the salad with the smooth avocado dressing.